Page revised in April 2010. 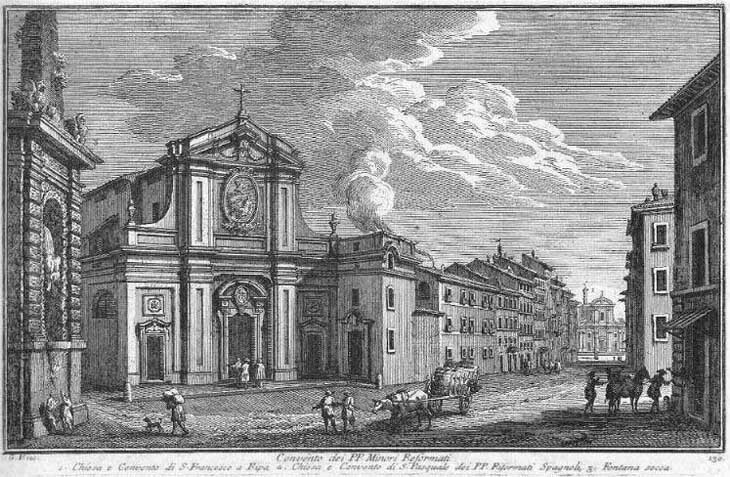 Pope Paul V and his nephew Cardinal Scipione Borghese did much to improve the living conditions of the inhabitants of Trastevere; Acqua Paola, the aqueduct built by the pope, provided the quarter with an ample supply of water which was distributed by monumental fountains such as that shown in this etching by Giuseppe Vasi; Cardinal Borghese thoroughly restored S. Grisogono; in 1611 the pope opened a new street between Piazza S. Maria in Trastevere and Piazza di S. Francesco a Ripa, behind which Porto di Ripa Grande, the river harbour of Rome, was located. The pope ordered those who built houses along the new street to plant elm trees in front of them, but at Vasi's time this regulation was disregarded and the fountain built by the pope was dry. 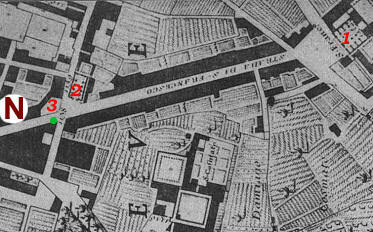 The view is taken from the green dot in the 1748 map below. In the description below the plate Vasi made reference to: 1) S. Francesco a Ripa; 2) S. Pasquale; 3) Fontana secca (dry). The dry fountain which was decorated with dragons, one of the heraldic symbols of the Borghese, was already in poor condition at Vasi's time and in ca 1890 it was pulled down. 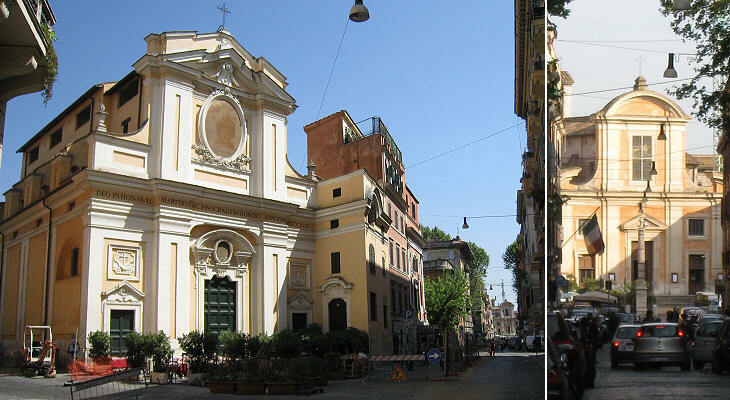 The long street leading to S. Francesco a Ripa is now crossed by a modern alley, but this change does not really impact on the view. The column in front of S. Francesco a Ripa comes from the ancient town of Veio and it was used to embellish Palazzo del Viceregente in Piazza Colonna. Pope Pius IX relocated the column here in 1847; it replaced a previous 1685 column which can be seen in the plate. The church and the adjoining friary were built in 1745 by Giuseppe Sardi on the site of a previous church dedicated to SS. 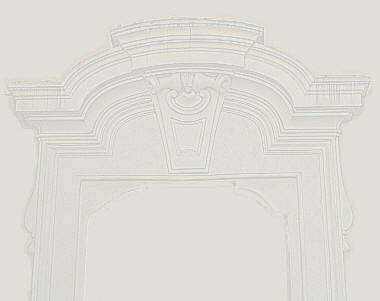 Quaranta (Forty Martyrs of Sebaste); the decoration of the buildings shows the influence of Francesco Borromini: it is rich, but at the same time poor, as it does not make use of marble or other expensive materials (the image used as background for this page shows the entrance to the friary). The new church was dedicated also to St. Paschal Baylon, a Spanish monk belonging to a branch of the Franciscan order; it was under the patronage of King Philip V of Spain, whose coat of arms was painted above the entrance. When St. Francis came to Rome to foster the recognition of his order he resided in a hostel near Porto di Ripa Grande; the building included a small church dedicated to S. Biagio; the complex belonged to the Benedictines of S. Cosimato, but in 1229 Pope Gregory IX gave it to the Franciscans; it was their first friary in Rome and they dedicated it to the founder of their order. 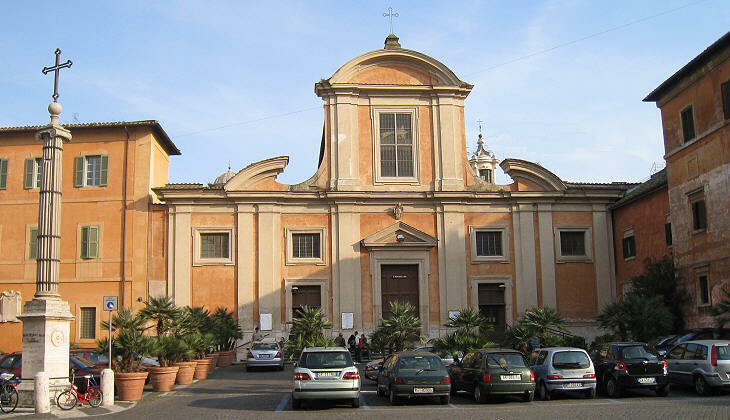 In 1249 the Franciscans were given S. Maria in Aracoeli, however, because the St. Francis had lived there, they retained also their first monastery. You may wish to see the church in a 1588 Guide to Rome. 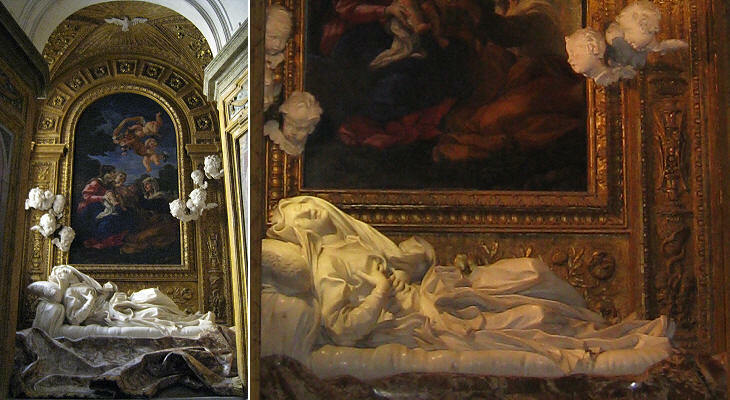 In 1671 Pope Clement X beatified Ludovica Albertoni, a XVIth century woman who was buried in S. Francesco a Ripa and a distant relative of the pope; the construction of a monument to her by Gian Lorenzo Bernini was followed by a thorough renovation of the church by Mattia de' Rossi a scholar of Bernini. 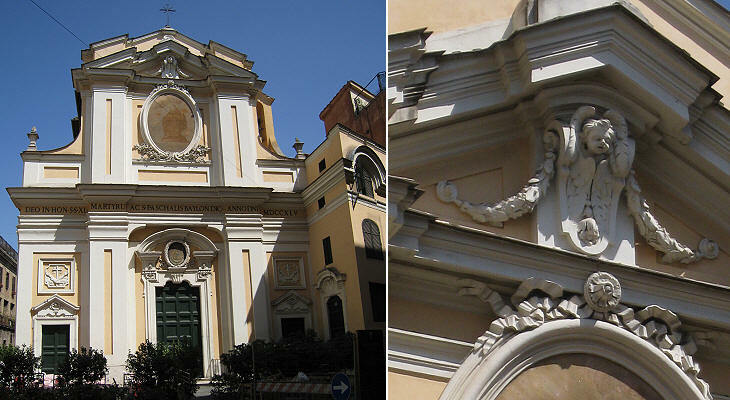 In 1710 a new chapel designed by Nicola Michetti was built by the Pallavicini Rospigliosi. In the short novel San Francesco a Ripa by Stendhal, Jean de Sénecé, the main character, is chased by a band of assassins; he seeks refuge into the church where he discovers that his own funeral is taking place. The Franciscan order was in favour of very simple tombs, yet the order could not resist the pressure of many important families who wanted to bury their members in S. Francesco a Ripa; so they could not object to the decision of Gaspare Albertoni Altieri, husband of a niece of the pope, to build a chapel for the Blessed Ludovica Albertoni. It is one of the last works by Bernini; although its design and decoration are not as elaborate as in Cappella Cornaro at S. Maria della Vittoria, yet it shows how the artist combined architectural design, statues, paintings, stuccoes and gilding to obtain the desired effect. 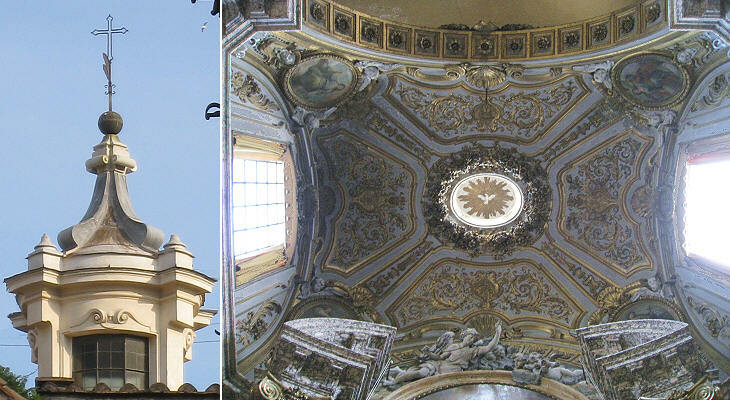 You can see more views of this and other chapels by Gian Lorenzo Bernini in Three Chapels by Gian Lorenzo Bernini. By placing similar funerary monuments in a chronological order it is possible to observe the evolution of the genre; the bust by Andrea Bolgi is set in a very elegant frame, which however is not coordinated with the shape of the statue; the second bust by Domenico Guidi is inserted into an oval which follows the curved lines of the shoulders; finally the third bust comes out from an oval and it gives the impression that the rest of the body is inside the wall. 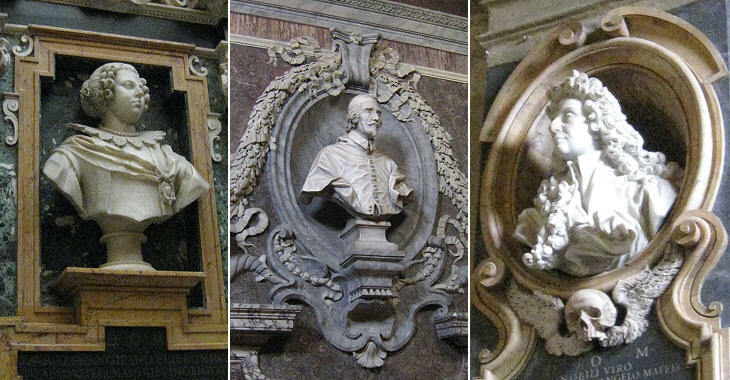 You can see more baroque monuments showing the dead in a medallion. Inside the friary a series of frescoes painted by Fra' Emanuele da Como in 1684-86 celebrate the Franciscan order. One of them shows five Franciscan Popes: from the left Nicholas IV, Alexander V, Adrian V, Sixtus IV and Sixtus V. Adrian V (at the centre of the painting) lived only 38 days after being elected, thus the painter showed Death behind him. The coats of arms of Adrian V and of Alexander V are the only ones of these popes which can be seen in Rome (today Alexander V is considered an antipope: he was elected in June 1409 in Pisa where he died in May 1410, without ever being able to reside in Rome). Chiesa de' XL. ss. Martiri, e di s. Pasquale Era quivi una piccola chiesa eretta l'anno 1122. da Calisto II. in onore de' ss. XL. Martiri, la quale fu poi data in cura alla compagnia del Confalone; ma essendo nell'anno 1732. conceduta ai frati Spagnoli di san Pietro di Alcantara, questi ora con i soccorsi venuti dalla Spagna e colle limosine del Card. Trajano Acquaviva hanno fatta di nuovo la chiesa, ed il convento col disegno di Giuseppe Sardi, e l'hanno ornata di varie pitture moderne.